George H. Wilson (1866-1949) of Louisville, Kentucky, received a patent (U.S. #476,853) for his “rimless [and] self-ventilating” artificial eardrum in 1892. 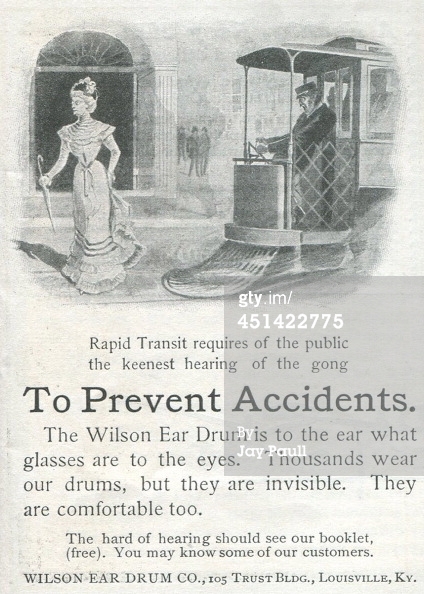 Often referred as “wireless phones for the ears,” the device was made of rubber, designed to be simple in construction and “so shaped that it can be quickly and readily removed and replaced without pain, and when in position is invisible, not liable to irritate, and is a good sound conductor.” Early advertisements for Wilson’s device, the “Common Sense Ear Drums,” emphasized its invisibility, both in public, and for the wearer themselves—the device was so resilience, soft, and painless, that even a user could forget they had them on. In other words, Wilson’s design ensured the prosthetic nature of the eardrums; they were so integrated with body that it became a part of it, and could be easily forgotten. Advertisements for the Wilson Ear Drum Company additionally capitalized on the technical and scientific aspects of the device: adverts were accompanied with an anatomical drawing of the ear, demonstrating the eardrum in position. Even the copy addressed the device as a “scientific invention,” rhetorically ensuring its legitimacy over other kinds of artificial eardrums available on the market. 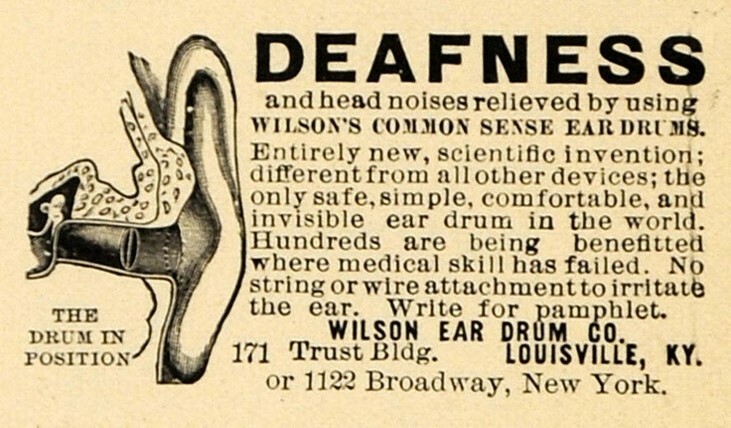 By the 1910s, however, the company’s advertisements dramatically shifted focus from the technical and scientific towards the morose suffering of the deaf person—Wilson’s Common Sense Eardrums were not only designs of science, but a cure so that no one could remain deaf. 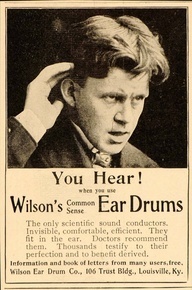 Other ads continued to portray deafness as curable when using Wilson’s Ear Drums, with the copy expanded at times to include testimonials. Customers could also write and request a pamphlet, which provided additional information about the benefits of the patented device in amplifying hearing; testimonials from satisfied customers further added support to the integrity and success of the device. The advertisements for Wilson’ Ear Drums indicated that with the device, a d/Deaf person would be happier as they were able to participate in hearing society and include themselves in ways previously denied to them. Jeffrey L. Cruikshank & Arthur W. Schultz, The Man who Sold America: The Amazing (but True!) Story of Albert D. Lasker and the Creation of the Advertising Industry (Boston, MA: Harvard Business Press, 2010), 52.